The Search function, in the Classes menu, is a powerful tool! It allows you to search through all of your classes to find only those that meet the criteria you select. With Search Classes it's easy to find 'needles in the haystack'. 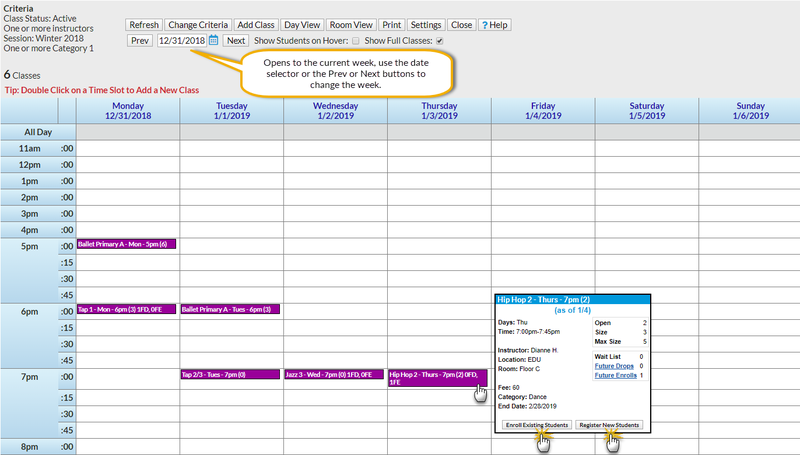 Create a Weekly Calendar showing only a particular instructor's classes. This is helpful for scheduling purposes. Generate a listing of all classes with openings that meet on Mondays. Use the Enroll link in the results to quickly enroll an existing student into a class(es). View adjusted openings for your active classes. 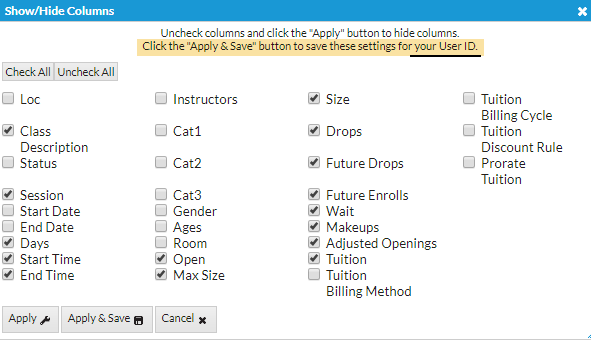 See, at a glance, which classes have openings after any future enrolls and drops, scheduled makeups, and waitlisted students are taken into consideration. 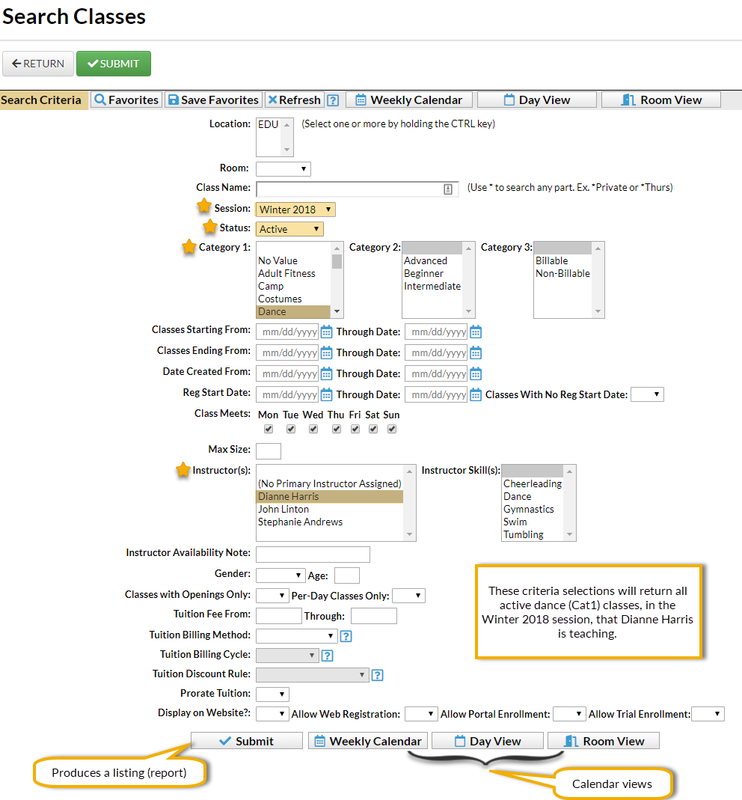 All of the search criteria in Search Classes pull information from fields in the Class record. The majority of the information is located on the Summary tab. The following display option examples illustrate the result of the search criteria selections made in the above image. Select Submit to display a listing of classes that meet your search criteria. Use the Restore Columns button to view all available columns. Use the Search field at the top of a column to search a column. Select the Enroll link to enroll an existing student into a class. Select Weekly Calendar to display a week-long calendar of classes that match the search criteria you selected. See The Weekly Calendar to learn about this awesome tool - it is your 'Command Central'! Select Day View to display a single date's schedule of classes that meet your selected criteria. See Daily Calendar (Day View) to learn more. 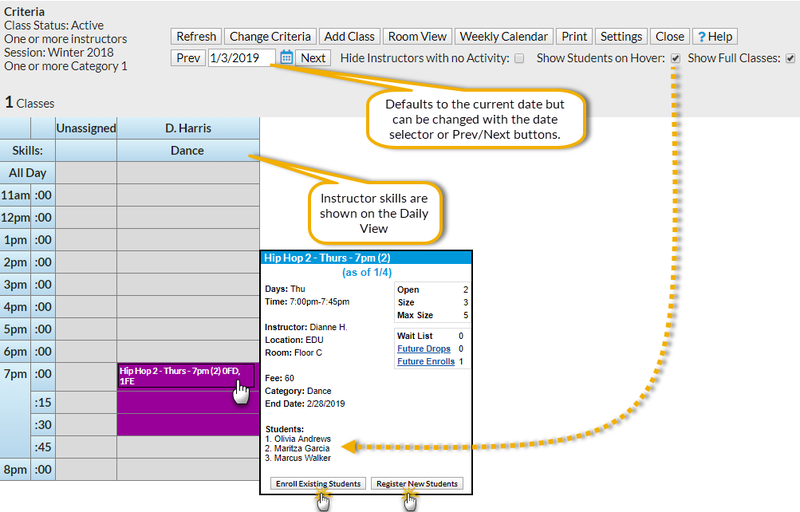 The Room View displays a single date's schedule of classes that meet your selected criteria. It will default to the current date but can be changed using the date selector or the Prev / Next buttons. You have the ability to enroll an existing student into a class from this calendar as well as register a new student and place them in the class. See Room View Calendar to learn more .